Nootropics have been shown to enhance the learning ability of healthy adults. The brain is more able to process and recall verbalized words if nootropics were administered prior. 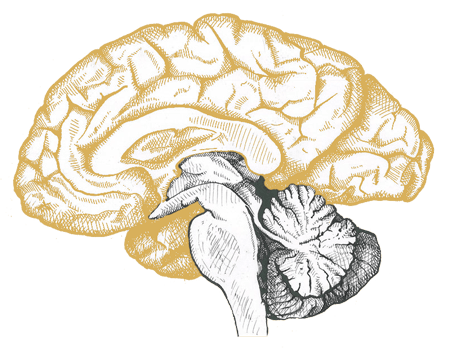 Memory formation is facilitated by the presence of nootropics in the brain. Nootropics are a category of agents that work selectively "towards the mind." 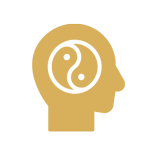 Derived from the greek words "noos" meaning "mind," and "tropein" meaning "towards," nootropics act directly on the integrative activity of the mind that occurs at the highest levels of the brain (the telencephalon). The telencephalon contains sophisticated structures including the hippocampus (where memory forms), Broca's area (where speech forms), and the corpus callosum (where information crosses between hemispheres). Because of the targeted action directly on the integration of these brain systems, nootropics are able to act on the full processes related to learning and memory including recall, processing, and consolidation. This selective action of nootropics also must occur while being neuroprotective, virtually free of side-effects and non-toxic, even at high doses even with long-term administration. No molecule had ever been found that possessed all of these properties until 1964, when, while working to develop a sleep-aid, scientists modified the naturally occurring neurotransmitter GABA. What they created instead of a sleep-aid was something much more profound, a molecule that would later be known as piracetam. The head neuropharmacologist of the lab, Corneliu Giugea, lead an in-depth study to elucidate of the properties of this molecule. The properties were so unique, including the enhancement of learning and memory while being neuroprotective, that in order to categorize it, an entirely new class was required. In 1972, he coined the term nootropics, meaning "towards the mind," for agents that act selectively to enhance the higher-level "integrative activity" of the brain. Improve learning acquistion and enhance resistance to learning impairments from casues such as lack of oxygen (hypoxia), electroconvulsive shock (ECS), and chemicals that tend to prevent memory formation (scopolamine). Facilitate the transfer of information from one hemisphere to the other, across the corpus callosum which increases synchronization between the hemispheres. Work by increasing the integration of higher-level (telencephalic) activity. 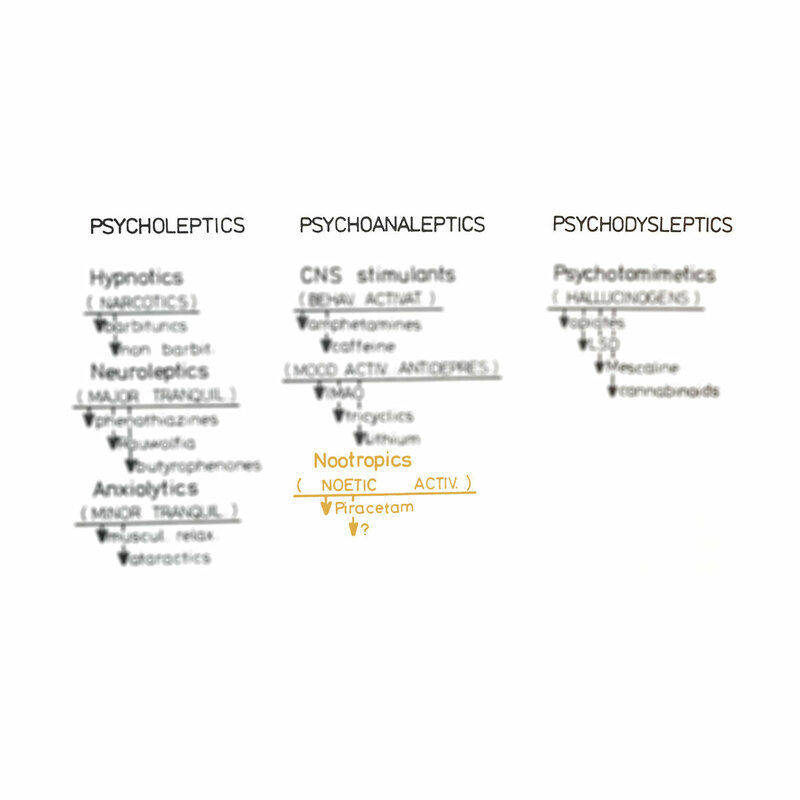 On over 30 classical pharmacological tests, the original nootropic shows no activity, including as neither a central nervous stimulant nor a sedative. Increase the brain's ability to resist aggressions and increase recovery time after loss of oxygen, physical trauma, and many chemical intoxications. While not acting on directly the central nervous system, nootropics are still able to modulate cortical tonic control, as seen in central nystagmus and spinal fixiation. Must work in harmony with the brain, being virtually free of side-effects and non-toxic even in high doses. Nootropics must not be habit-forming or cause withdrawal. The nootropic concept had to be developed because a molecule was discovered that had properties unilke anything before it. This molecule, now known as Piracetam, was able to enhance learning and memory while being protective of the brain, and had little to no side effects. 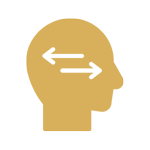 Piracetam was the prototype for the nootropic concept and forms the greatest body of evidence on the efficacy of nootropics. 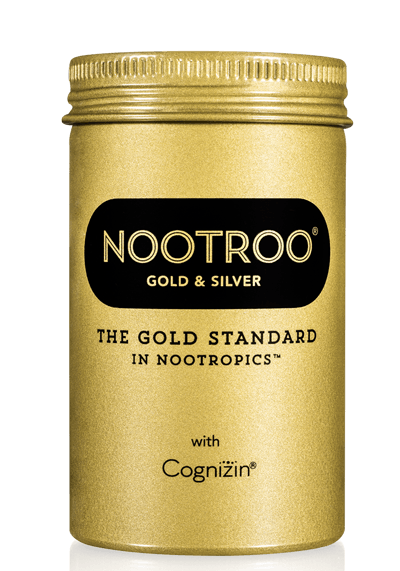 The Nootroo Gold and Silver Formulas are based off of this research and include next-generation, more advanced versions of piracetam each stacked synergystically with citicoline (Cognizin). 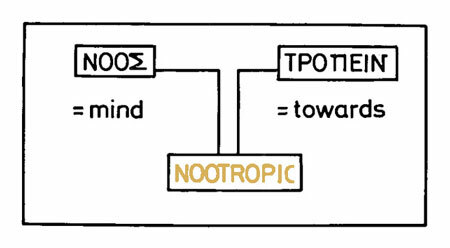 The term nootropics is derived from the Greek words for “mind” and “towards” and means “towards the mind.” Nootropics are molecules that have “a selective activity upon the higher-integrative mechanisms of the brain.”1)Fundamentals to a Pharmacology of the Mind, Giurgea 1981 P 192 They act directly on the parts of the brain where information is brought together on the highest level and as such are able to positively enhance the processes related to learning, speech, and memory acquisition, consolidation, and recall. To be considered a nootropic, these properties of enhanced activity must occur while also being protective of the brain and while having little to no side-effects. In 1964, scientists in Belgium were working to develop a sleep-aid. The scientists modified the naturally occurring neurotransmitter GABA, but what resulted instead of a sleep-aid, was something much more profound, a molecule that would come to be known as piracetam. 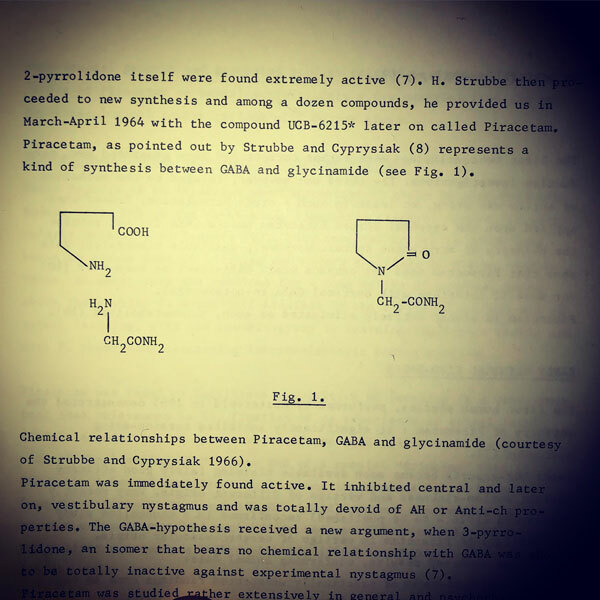 As they probed the properties of the molecule, it became increasingly clear that it was so unqiue, that an entirely new category would be required to describe it, and so in 1972, Cornlieu Giurgea proposed the nootropic concept. 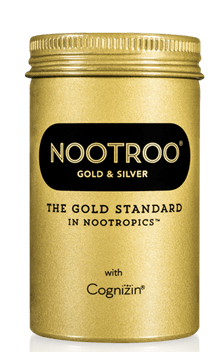 What is Nootroo Gold & Silver? 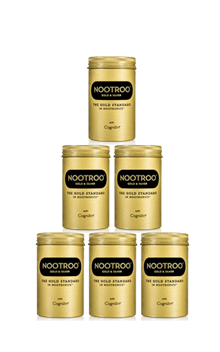 Nootroo Gold & Silver is our premium nootropic stack based on the continued research into nootropics over the last 50 years. The Gold and Silver Formulas each have a different main, next-generation nootropic paired with the precursor for the memory neurotransmitter. 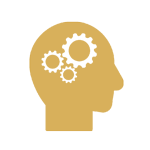 The Gold Formula contains Noopept and Citicoline (Cognizin) and the Silver Formula contains Phenylpiracetam and Citicoline (Cognizin). 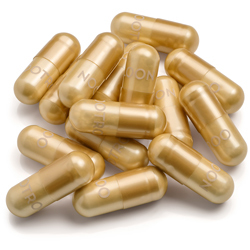 Each bottle contains 30 total pills, with 15 of the Gold Formula and 15 of the Silver Formula and can be distinguished by their non-artifically colored capsules. 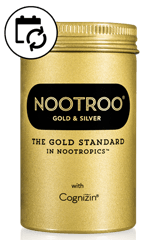 We are now shipping our 5.0 version of Nootroo Gold & Silver Formulas. How Do The Formulas Work? The combination of the ingredients in both the Gold & Silver Formulas are considered to be synergistic stacks. Research shows that the underlying mechanism of the combination has a “profound effect on memory enhancement.” Citicoline administration alone in healthy adults alone increases the levels of the main neurotransmitter responsible for memory formation, acetylcholine in the outside areas of the brain. When combined with piracetam-like nootropics, the increased acetylcholine is brought into the hippocampus where it is more fully utilized by the brain. The combined effects of nootropics+choline are greater than either alone. 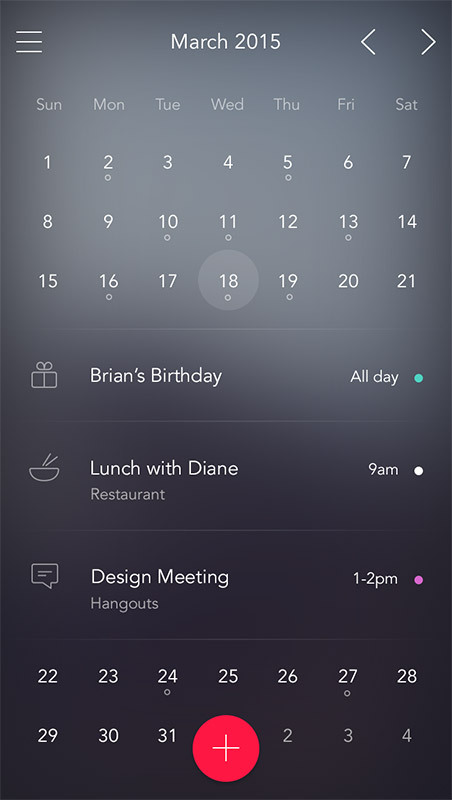 What is Nootroo the Company? 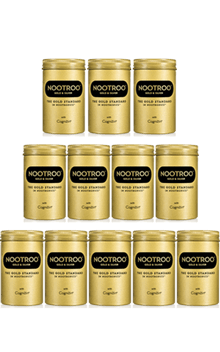 Founded in 2014, Nootroo is dedicated to creating the highest quality nootropic stacks available. 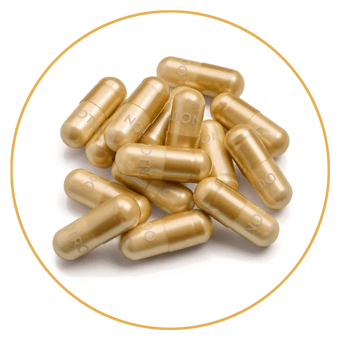 Our tagline is “The Gold Standard in Nootropics” because of our commitment to using only the highest possible quality ingredients. 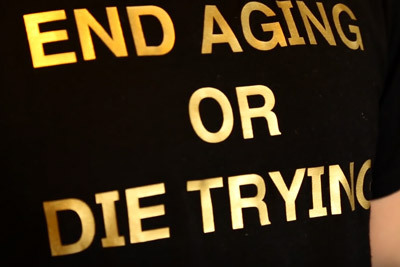 In fact, that tagline (and our gold branding) comes from the fact that we used to use actual 23.5k gold flakes in our Gold Formula and 100% pure silver flakes in our Silver Formula to distinguish betwen them, before we manufactured our custom, non-artifically colored capsules. Our commitment to quality goes beyond aesthethics though, as we are commited to making sure everything else in the capsules is pure as possible. We carry out 3rd-party lab testing on all of our ingredients with a spec of 99% purity and A+ ratings, and we license the purest form of citicoline, a patented bioidentical form from Japan called Cognizin. 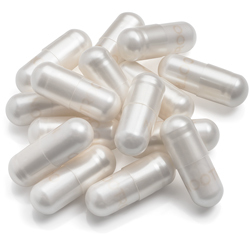 Our capsules also contain no binding agents, fillers, excipients or anything besides the high-purity ingredients listed. With Nootroo you can be confident knowing that we never cut corners and that you always have the best nootropics available. Piracetam was shown to significantly increase the memory of healthy college students in less than 14 days of daily use on a word recall test. Nootropic effects generally increase over time and this study concluded that nootropics are "capable of extending the intellectual functions of man." 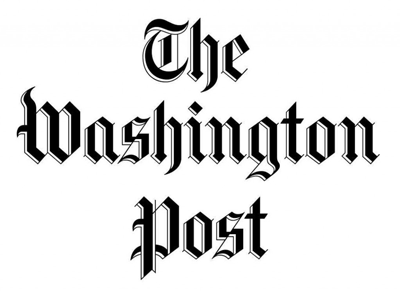 Healthy adults had a 15% increase in the number of words recalled on a test of verbal recall. Words heard by the left ear had to cross the corpus callosum in order to reach the verbal processing region on the other side of the brain in order to be verbalized. Piracetam is not a stimulant and does not work by directly affecting the central nervous system as caffeine or an amphetamine does. Piracetam shows no activity on over 30 different tests and has demonstrated little to no side-effects, including no toxicity, even in extremely high doses. 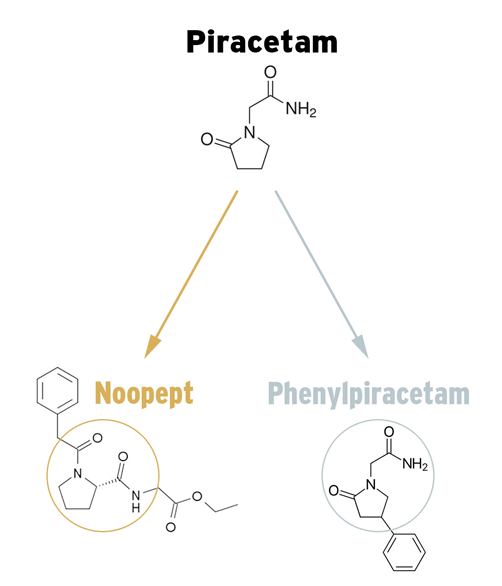 While piracetam is an amazing molecule, its accidental discovery meant that it wasn't invented with a directed focus on cognitive enhancement or neuroprotection. Fortunately, in the intervening decades since piracetam's discovery, research labs around the world set out to make improved versions with additional benefits and they succeeded beyond their expectations. Two of the best versions created were noopept and phenylpiracetam. Noopept is a di-peptide version of piracetam that has very high bioavailability and demonstrated anxiolytic properties. Phenylpiracetam was created by adding a "phenyl" group to piracetam which gives it increased bioavailability and some psychomotor activity. The circles below show where the piracetam structure is within these new molecules. 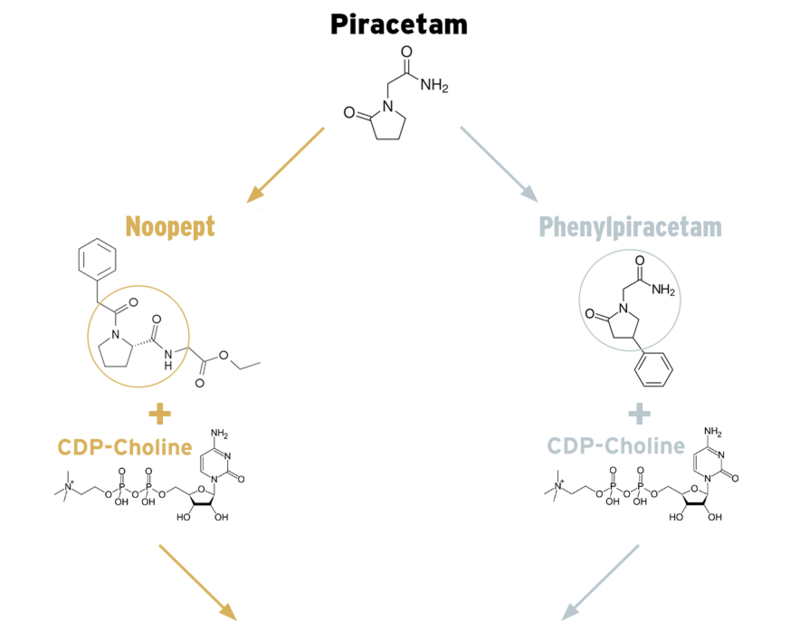 Taking these advanced forms of piracetam and adding a bio-identical form of the body's preferred choline source is how you get the Nootroo Gold & Silver Formulas. Noopept is a di-peptide version of piracetam specifically developed to be more powerful and absorbable from oral administration. The researchers from the lab that created it, specialized in creating peptide versions of other molecules, and created hundreds of modified versions of piracetam before selecting Noopept because it is was highly absorbed and "demonstrated a wide spectrum of cognition improving effects. "2)Ostrovskaya RU, Romanova GA, Barskov IV, Shanina EV, Gudasheva TA, Victorov IV, Voronina TA, Seredenin SB: Memory restoring and neuroprotective effects of the proline containing dipeptide, GVS-111, in a photochemical stroke model. Behav Pharmacol 1999, 10:549–553 This molecule has been demonstrated to have both positive short-term and long-term effects at enhancing memory and mental processing, especially in older populations. In adults with (a) cognitive decline and (b) post-concussional syndrome, Noopept was shown to have an even more powerful and consistent effect compared to piracetam. 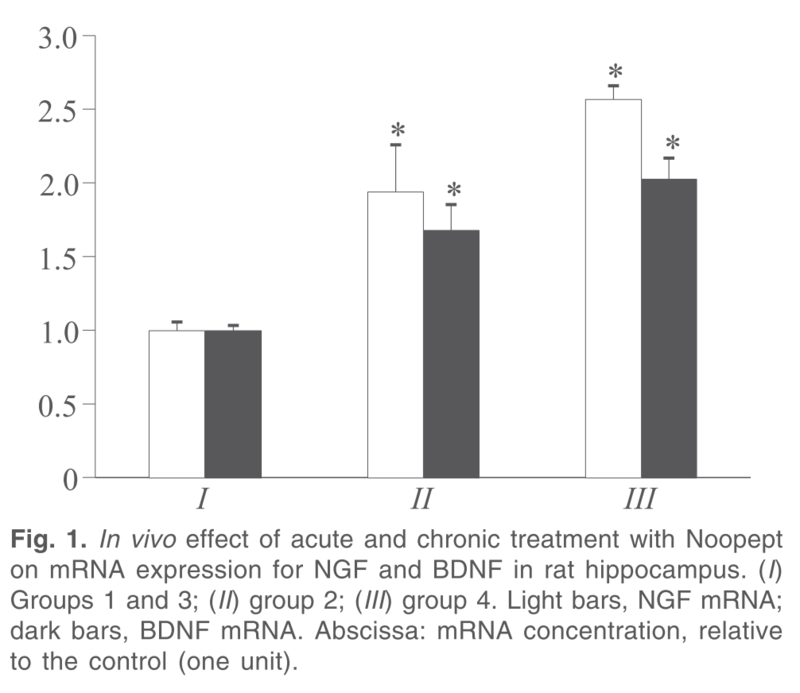 Noopept significantly increased the brain-derived neurotrophic factor (BDNF) in the brain. BDNF levels control the quantity of new neurons created by the brain. 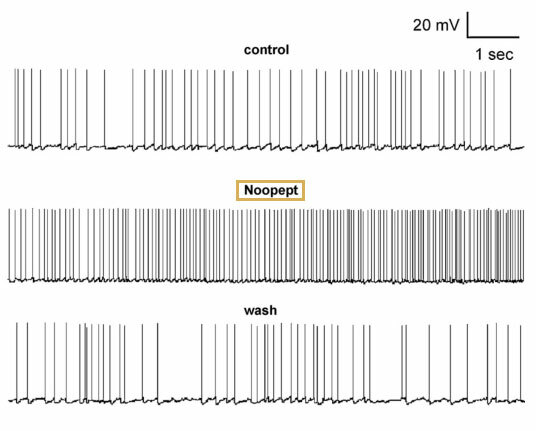 Noopept has been shown to increase the firing rate of pyramidal neurons in the hippocampus. These neurons are implicated in memory formation and recall. CDP-Choline, as will be discussed more in depth down below, is the body’s preferred precursor for the memory neurotransmitter acetylcholine. Supplementation of acetylcholine alone will increase acetylcholine production in the brain. Nootropics alone will increase the body’s use of acetylcholine in the process of forming memory. So when combined, the power of this increased supply to meet the brain’s increased neurochemical demands, has been shown to have “profound effects” compared to either alone. Phenylpiracetam is a version of piracetam with an added phenyl group designed to increase processing speed and provide mental endurance. This added group increases piracetam's affinity for the receptors that control psychomotor activity (where movement and thinking are combined), while not not being a central nervous stimulant. 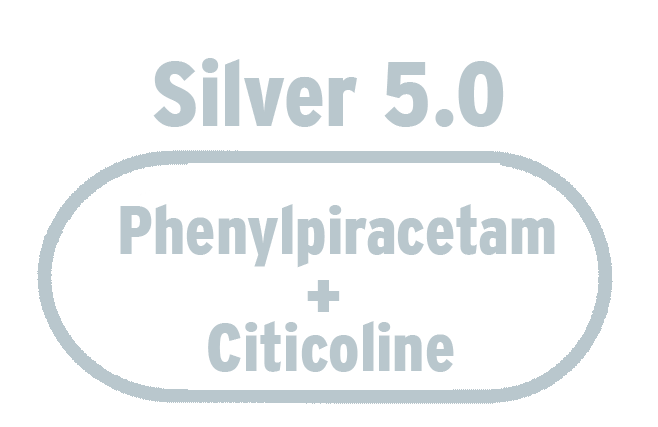 Phenylpiraceatam has been shown to significantly speed up processing and endurance, even in single doses. It was utilized by the Russian space program for use by cosmonauts on extended missions. 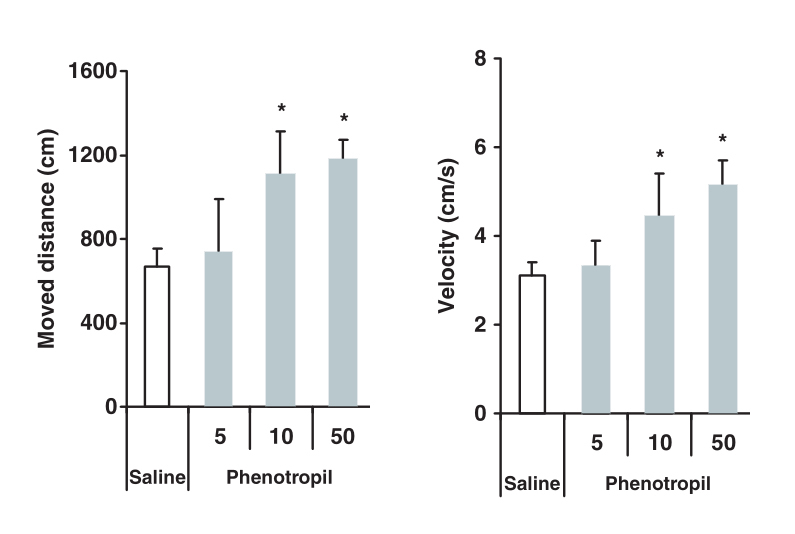 Phenylpiracetam was shown to increase the amount of distance covered in exploratory trials. This correlates to an increase in mental activation and endurance. Phenylpiracetam was shown in this study to regulate the brain waves against aggression in an epilepsy model. Autonomic normalization is a property that helps ensure consistent brain activity against things that would tend to disrupt it. Phenylpiracetam has also been shown to prevent a memory blocking agent, scopolamine, from blocking memory formation. This is a powerful indicator of the effect of phenylpiracetam on memory formation. One way phenylpiracetam works, is by activating and enhancing the activity of the cholinergic system in the brain. The cholinergic system modulates memory and learning and in order for it to operate optimally, it needs the molecule acetylcholine to be at certain levels in synapses. CDP-Choline is the precursor for acetylcholine, and by adding it to the body, the brain will increase its choline levels. By increasing the amount of choline available, the brain will then utilize more of it and in doing so, will enhance the firing mechanisms of this system. This allows phenylpiracetam to have an optimized cholinergic system to interact with. CDP-Choline, also known as citicoline, is a precursor for the memory neurotransmitter acetylcholine. Supplementation has been shown to increase acetylcholine production in the brain. 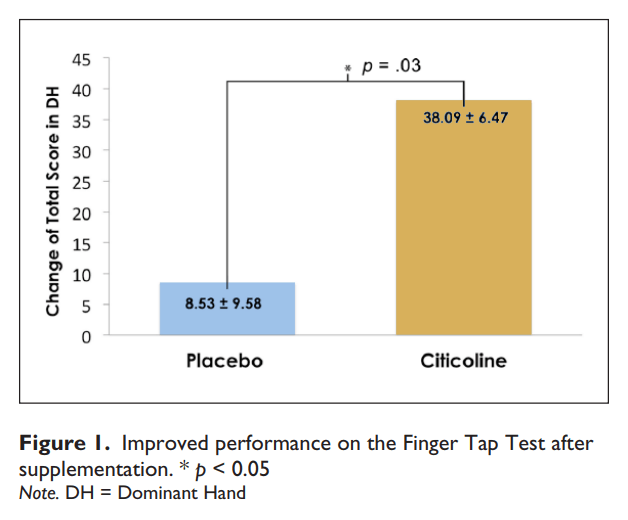 Citicoline administration has also been shown to increase brain bioenergetics by increasing energy reserves and utilization of energy.3)Citicoline enhances frontal lobe bioenergetics as measured by phosphorus magnetic resonance spectroscopy.. Studies in healthy adult women show that taking Cognizin citicoline significantly improved their verbal memory after just 28 days.4)Improved Attentional Performance Following Citicoline Administration in Healthy Adult Women Studies suggest that citicoline also can help increase dopamine receptor densities 5)Giménez R, Raïch J, Aguilar J (November 1991). "Changes in brain striatum dopamine and acetylcholine receptors induced by chronic CDP-Choline treatment of aging mice". 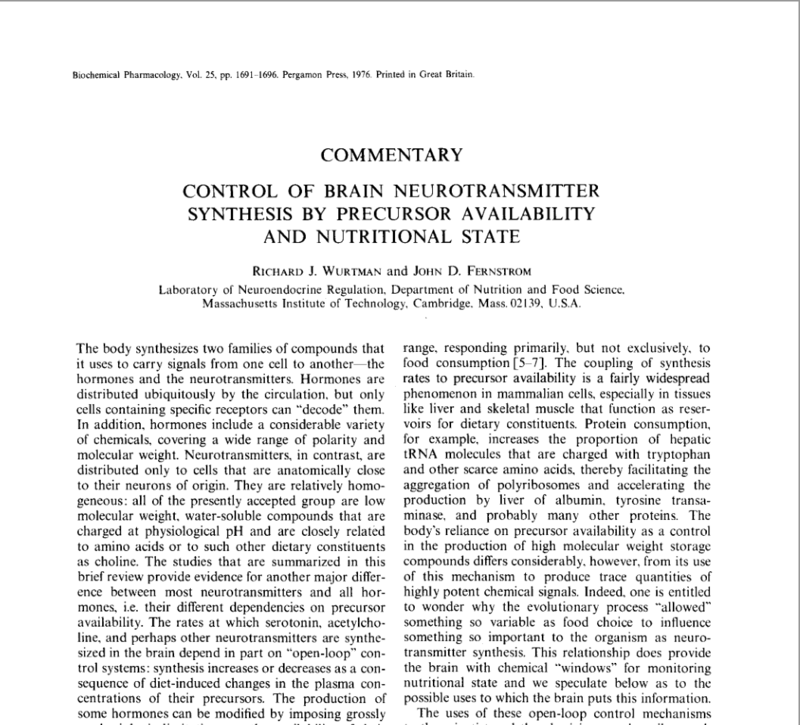 British Journal of Pharmacology 104(3): 575–8., which is the neurotransmitter associated with motivation. We license Cognizin, a patented form of Citicoline, that is the only pure, free-base form of citicoline that is bioidentical to the form found in nature. Healthy adult women taking CDP-Choline have been shown to have an improvement in memory and focus after 28 days. 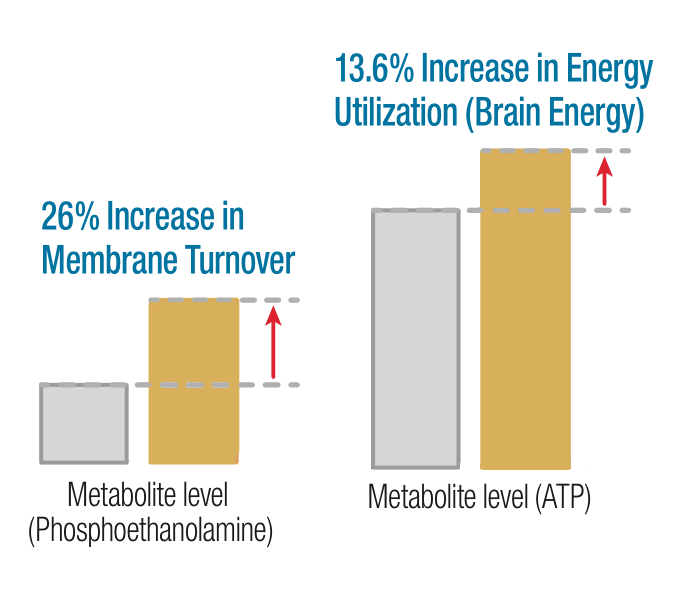 The levels of the energy carrier molecule (ATP) were increased by 13.6% by CDP Choline and cell membrane turnover was increased by more than 25%. CDP-Choline alone in adolescent males for 28 days was shown to significantly increase psychomotor speed and improve attention compared to placebo. CDP-Choline is an essential nutrient that is crucial in the brain’s processes of memory formation, attention and learning, yet most people are deficient in it. CDP-Choline is typically obtained by the body from food and supplies choline for the brain to make the neurotransmitter acetylcholine as well as neuronal cell membranes. That is why simply adding it to the body results in a >25% increase in cell membrane formation as well as >10% increase in cellular energy (ATP) levels. 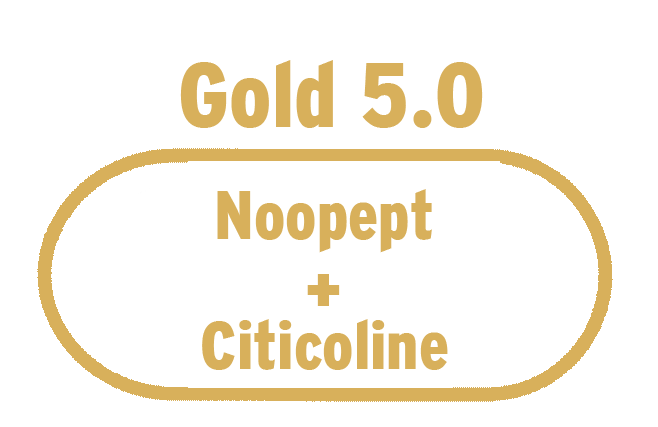 The recommendations for adults is between 450-550 mg per day, both Nootroo Gold & Silver have approximately 500 mg of the purest form of CDP-Choline available, Cognizin branded CDP-Choline. It is made in an enzymatic process in a bioreactor that takes 6 months and is imported from Japan. This patented-form of CDP-Choline is the only form that is bioidentical to the form found in nature, in a free-base and not a salt. 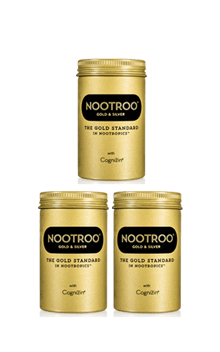 Nootroo is considered “The Gold Standard In Nootropics” because of our commitment to creating the highest-quality and most effective nootropic blends on the market. Meditation is a key element to enhancing your brain’s ability to focus and stay on task. Mindfulness meditation can change your brain in as little at 8 weeks. We will provide resources to help you learn and sustain a meditation practice. Exercise is crucial for optimizing brain health, metabolism and neuroplasticity. 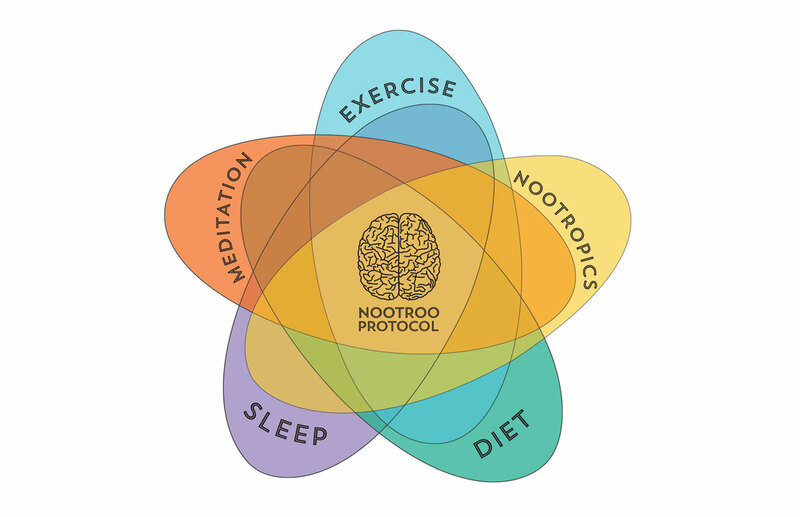 The Nootroo Protocol will teach you the most effective and efficient exercises for the brain from both the physical and mental realms. Nootroo Gold & Silver have you covered in this category, but we will also share with you additional tips, tricks, nutrients, and supplements that can help you get the most out of your nootropics (and brain). Sleep is crucial to memory formation, consolidation, and general brain health. We will teach you techniques to help you sleep better, increase neurotransmitter synthesis, wake up feeling more refreshed and even how to fall asleep more easily. 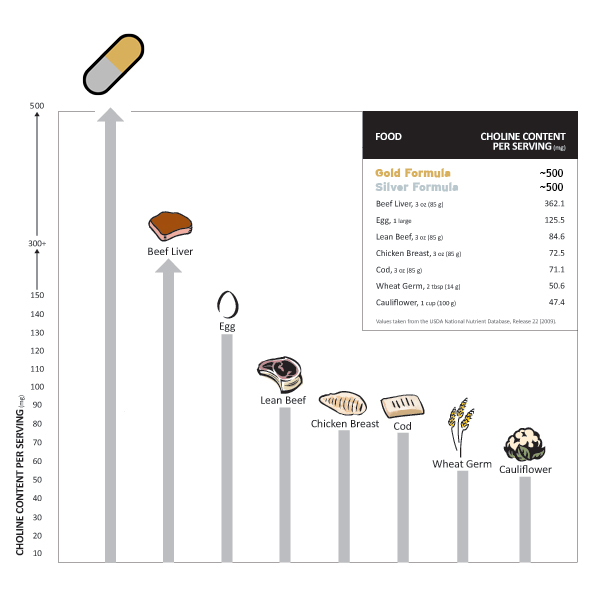 Diet is a key regulator of energy and how you feel. We will teach you dietary tricks to optimize your body’s metabolism so that your brain can receive more energy and utilize that energy more effectively. 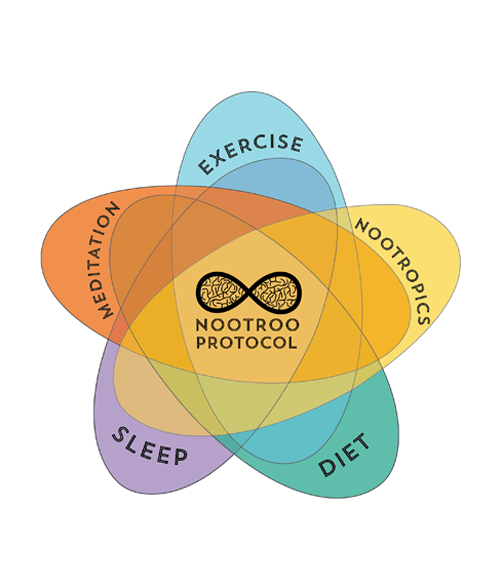 The Nootroo Protocol has been designed to bring together all of the most important aspects for optimal performance and health. 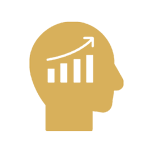 As a subscriber, you will receive continued access to our knowledge-base as well as a step-by-step tips and information to aid you in achieving optimal performance. But we do more than just create the best nootropics, we have also developed the Nootroo Protocol to help you integrate into your life, the activities and habits that research shows are essential for achieving optimal performance. “It’s not like every tech worker in Silicon Valley is taking nootropics to get ahead,” Burke acknowledges. “It’s the few who are getting ahead who are using supplements to do that...” These days, he buys his stack from Nootroo, a San Francisco company. "Tweaking brains with ‘smart drugs’ to get ahead in Silicon Valley"
“We’re talking about...a new type of biology where we’re taking these things into our own hands but also to try and proactively go from baseline to above,” said Matzner. "Eric takes nootropics...a mix of compounds...that claim to improve cognitive function, increase alertness and strengthen memory and recall." [Nootroo’s] pills come in “gold” and “silver” formulas, which are to be taken on alternating days. Over time, they’re intended to enhance focus, memory, and cognitive function. The BBC came to check out what is going on in Silicon Valley with those choosing to enhance their biology and push forward science, to see if they just might end up pushing forward the world. 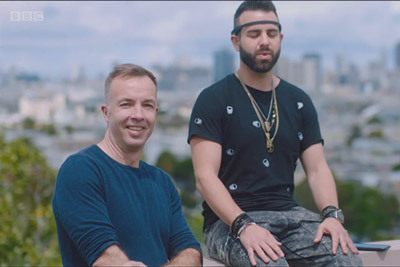 NPR wanted some tips on how biohacker and Nootroo founder, Eric Matzner, starts his day, so he showed them a basic adaption of the Nootroo Protocol. In the early 1960s, scientists were working to develop a form of the neurotransmitter GABA, that would be able to cross the blood-brain barrier and potentially work as a sleep aid.6)How To Deal With An Unusual Pharmacological Pattern: The Nootropic Case, C Giurgea, P197, 1976. While they succeeded in developing a molecule with the ability to enter the brain, they failed at creating a sleep aid. What they discovered instead, however, was a molecule that would later prove to be much more profound. Like a sculptor removing parts of the stone to reveal the beauty within,7)"Within the marble itself, Michelangelo thought lies the beauty, it is not created by the sculptor. He only takes out the excess of stone and so makes beauty available to our eyes. Scientific creativity often resembles this process...He only removes the excess of misunderstanding...That was the case with our nootropic research which we now consider as one potential approach to the pharmacology of the integrative activity of the brain." Corneliu Giurgea (1981) Corneliu Giurgea, the lead scientist at the lab, and his team would work diligently to chip away at the unknowns of piracetam, to reveal the properties within it. After 9 years of research, Giurgea had determined that this molecule (piracetam) acted in such a unique way on the higher-level, integrative activities of the brain, that in order to classify it, the creation of an entirely new classification was required: " the nootropic approach to integrative activity of the mind." On over 30 pharmacological tests, Piracetam was found to have no activity, including being neither a sedative nor a stimulant. It also had no toxicity and few side effects, even when given in extremely high doses, such as grams per kilogram of body weight, to mice, rats, cats, dogs, and monkeys with single or multiple doses, even over long-term administration. In fact, because of those properties, piracetam seemed to be inactive. Had it not been for a test on nystagmus (involuntary eye movements), where they found it immediately active, piracetam likely would have been passed over. This discovery was especially intriguing to the researchers because all of the then-known agents active against nystagmus were either antihistamines or anticholinergics. As they were carrying out these follow up studies over 1966-1967, a series of surprising results were reported. First, results came in from a study done at a hospital in Finland on post-concussion patients. The scientists running the study wrote to Giurgea13)Personal Communications between Giurgea and Prof. Hilboom and Dr. Jahro to let him know that the "patients memory seemed somehow improved, that they declared to 'think' better. "14)How To Deal With An Unusual Pharmacological Pattern ; The Nootropic Case, C Giurgea, P198, 1976. 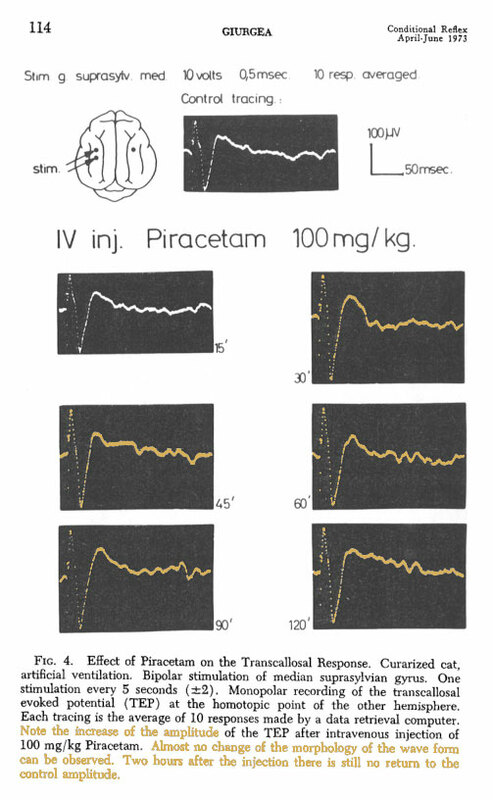 Then came word from a trial in Brusseles15)Personal Communications between Giurgea and Prof. Sorel on epileptic children administered piracetam. The parents of the children in the study "claimed a kind of improvement in the overall mental efficiency." 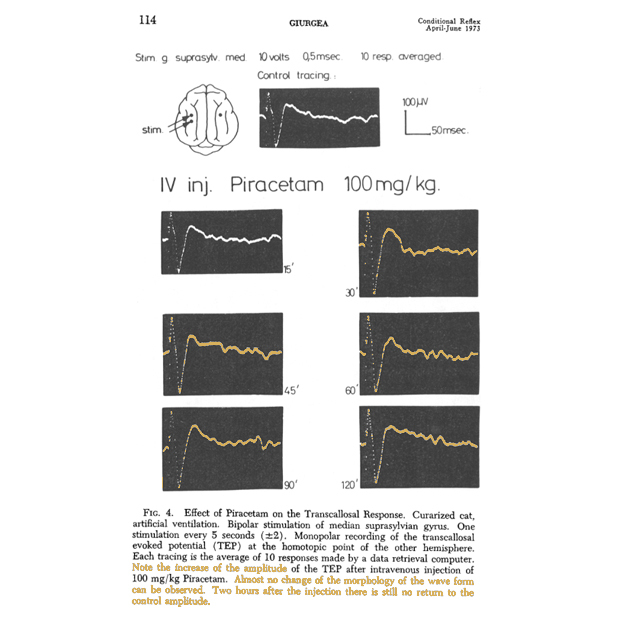 And then another researcher16)Personal Communications between Giurgea and Prof. Ectors in Bruxelles reported to him that his Parkinsonian patients under Piracetam were "somehow more aware of their sickness." 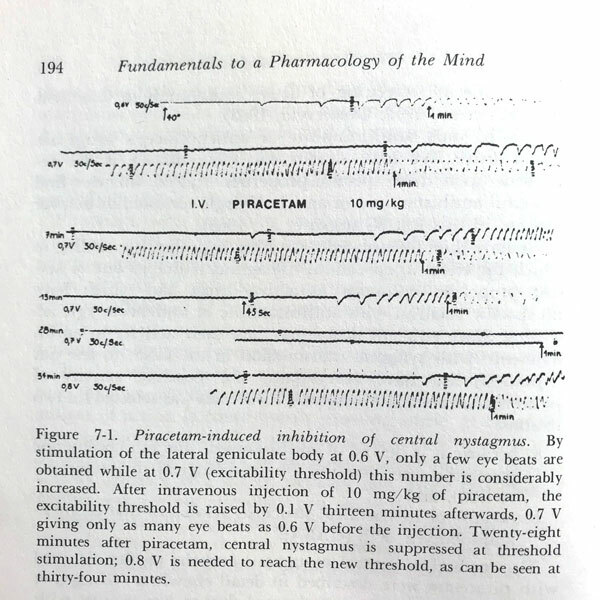 Since Giurgea and his team had previously demonstrated piracetam selectively enhanced interhemispheric communication (see associated image), he had suspected that the compound might facilitate other cortically integrated mental functions, but at that time, he had no idea the extent. As experimental data on the neurochemical mechanisms of piracetam continued to expand, Giurgea and his team began to zero in on some overarching properties of the molecule that would come to define the nootropic class. 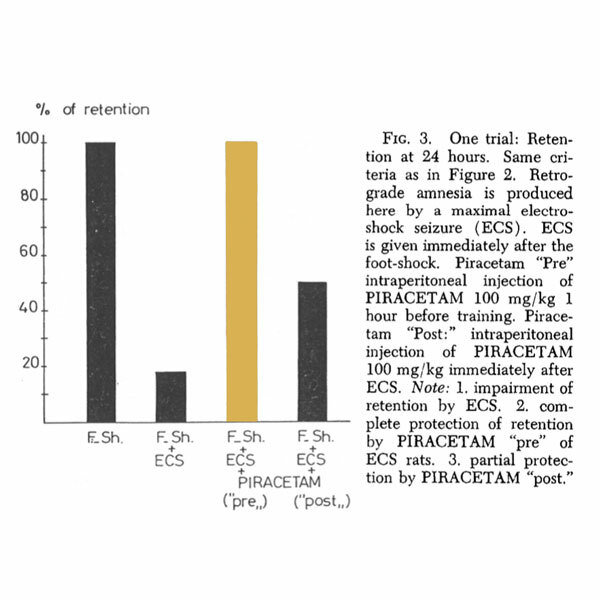 In normal subjects, piracetam appeared to "activate efficiency of higher nervous function" and in the case of injury, piracetam appeared to "protect and/or facilitate restoration of normal brain activity." Rats learned how to exit a water maze much more quickly when on piracetam. Notice the change in the amplitude of the evoked potential of the corpus callosum, without a change in morphology. Demonstrating telencephalic selectivity. 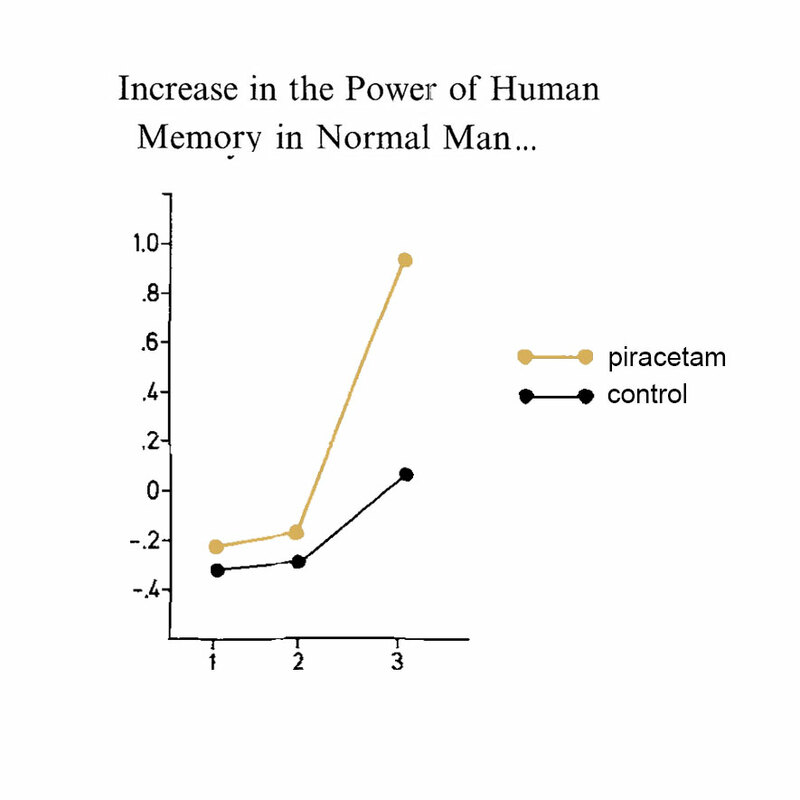 Memory is protected from disruption during a loss of oxygen (hypoxia) if the rats are given Piracetam prior. After having their brains electroconvulsively shocked, after 24-hours, rats given piracetam prior remembered 100%, while rats on placebo remembered less than 20% of the time. 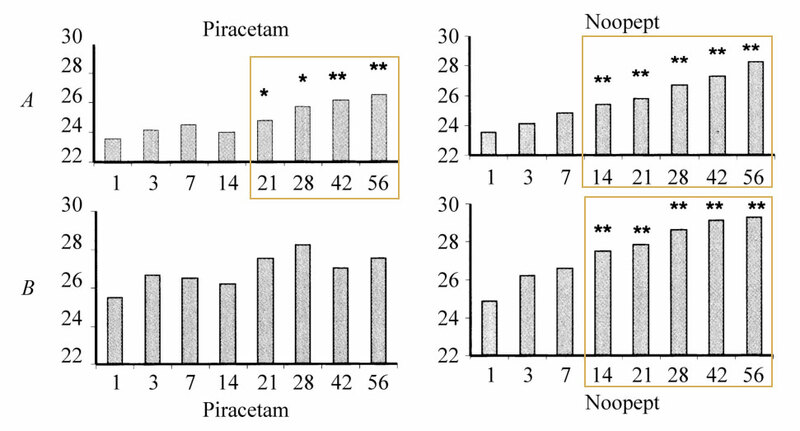 Piracetam suppresses nystagmus at high and low doses and enhances the stimulation threshold. No sedation or tranquilization, no stimulation, no interference with synaptical transmitters, no acute or long-term toxicity. 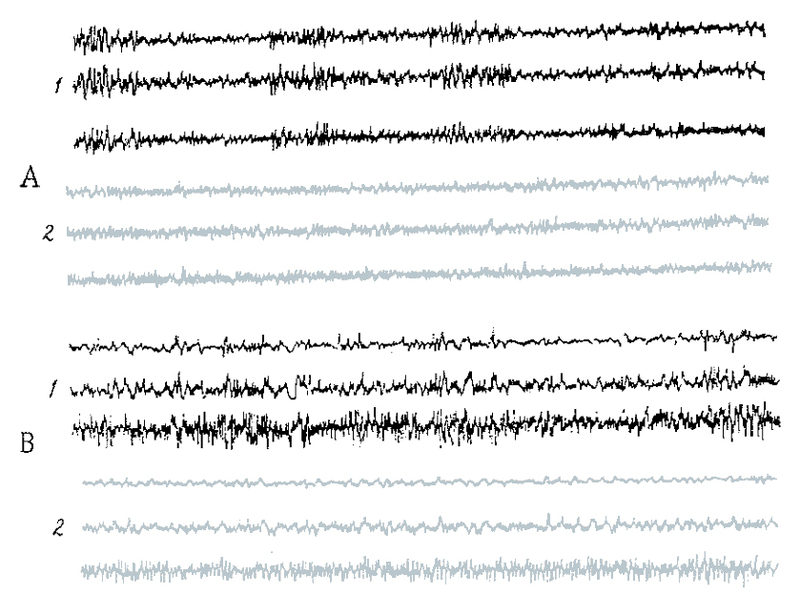 No cortical or subcortical EEG changes in reticular sensory or direct arousal threshold, etc. No changes of the cardiovascular, respiratory, gastrointestinal systems. 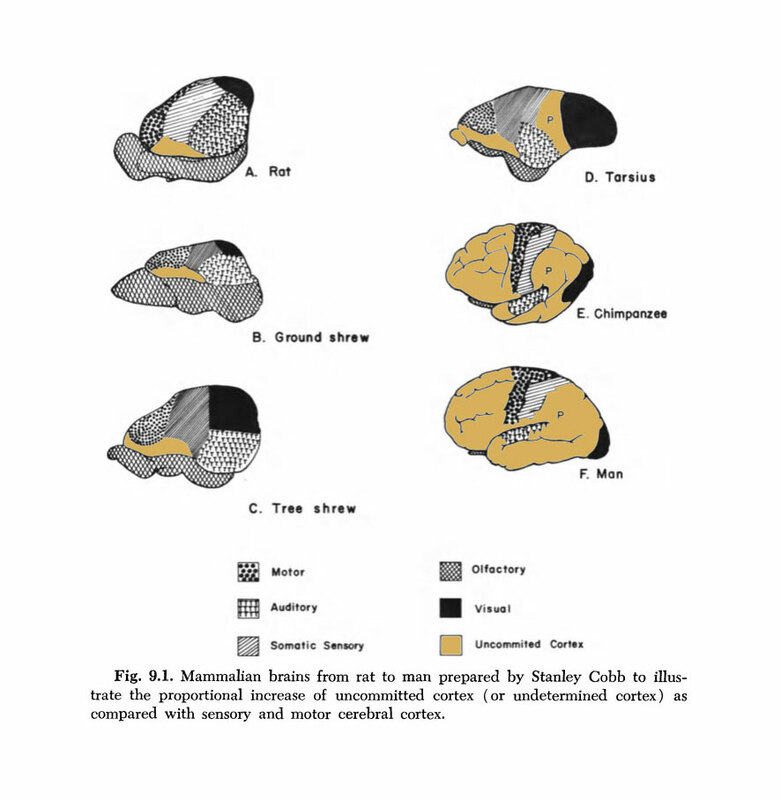 ”"Man's brain is remarkable among mammals because of the greatly increased volume of the cerebral cortex...Unlike the cortex of the rat, which is completely motor or sensory except for a small undefined area, most of the human cortex is neither sensory in function nor motor... Man is different from lower mammals...[he is] part of an evolving society. He has in his brain, extensive areas of undefined and uncommitted cerebral cortex... The brain of man is molded by his mind." Thus, Giurgea said, by understanding the evolutionary, structural, and functional arguments of the role played by the telencephalon in higher mammals, "it then becomes conceivable that one could pharmacologically intervene in a direct, specific manner upon the integrative efficiency of the telencephalon. And from that perspective, he put forward the nootropic concept. Through our sensory abilities, we create a "phantom-like" image of the real world. And then from complex, "integrating activity" in the telencephalon, we then derive our "capacities [of] perception, conscience, and other features of the inner life of a human being." While other classifications include molecules that can have an effect on higher mental function, it is usually through an indirect pathway and is typically accompanied by side effects (especially in high doses). 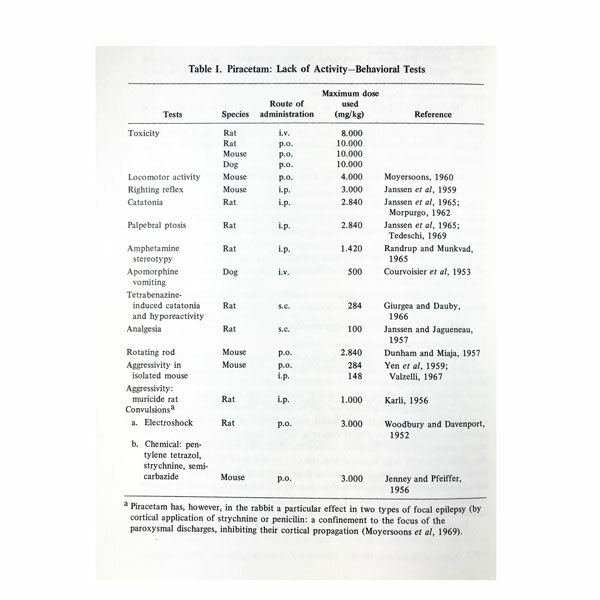 No other class includes agents that act directly on higher-level integrative activity or met the other properties and so it became clear that piracetam was the forerunner of an entirely new class. 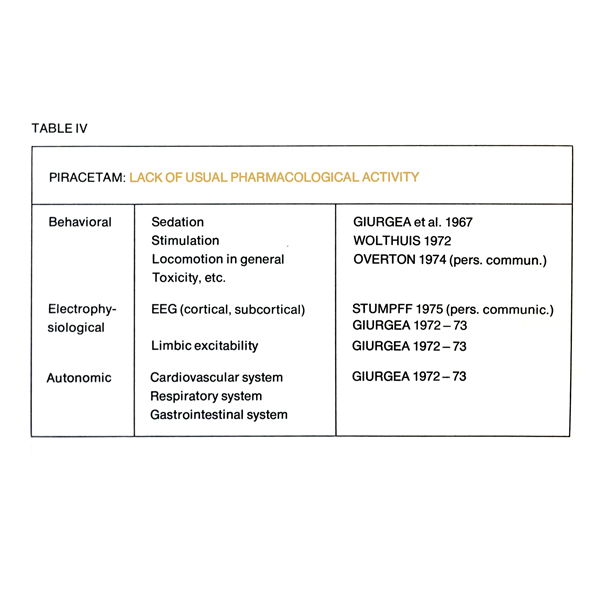 Based on the evidence of a direct, selective activity of piracetam on the higher integrative mechanisms of the brain, in 1972, Giugea proposed the formation of an entirely new class of agents that would be known as nootropics, meaning "towards the mind." Nootropics are practically nontoxic and bear a direct impact on noetic, telencephalic, higher integrative mechanisms. Now that scientists had a framework for understanding the action of piracetam, they began devising new studies to explore how increases in efficiency of high-level activity could be demonstrated in healthy humans. In 1975 a study was devised to test the transfer of information across the corpus callosum in healthy college students. Researchers administered a dichotic listening test, where words are played simultaneously on stereo headphones (with one message in the right ear and another message in the left ear), and subjects would be asked to write down as many words as they could remember from each ear. Because words that come in the left ear are processed in the right side of the brain, then sent to the language area on the left side, they must cross the corpus callosum. This study showed remarkable results, the students on piracetam showed a 15% increase in their verbal capacity. The scientists referred to this as a "superconnection of the brain," and stated: "what does seem to be established...is that there is an increase in the capacity for learning and the registration of verbal information is increased...It is tempting, however, to believe that superconnection not only leads to increased registration but also plays a part in integrating different brain areas and thus lead to a greater capacity for learning." "Increase In the Power of Human Memory"
As a follow up to the "superconnection" study, the researchers22)Dimond and Brouwers set up another placebo-controlled, double-blind study on healthy college students. Instead of verbal learning though, they decided to test recall with written words. In the study, subjects were shown two-syllable long words and were asked to recall them after varying lengths of time. After 14 days of treatment with piracetam, they found that both direct and delayed recall was significantly increased. The researchers concluded that "piracetam promotes verbal learning and in this, it would appear to be a substance which in a specific respect is capable of extending the intellectual functions of man." Researchers studying deficient brains in older populations are constantly working to activate the cholinergic system, as the neurotransmitter acetylcholine is directly implicated in memory. Normally, administering choline alone can increase cholinergic transmission and raise the levels of acetylcholine in the brain. However, in some older patients, their cholinergic systems are so deteriorated, that they are unable to turn the choline into acetylcholine. The scientists theorized that if they could administer choline, while simultaneously administering a compound that could correct for the critical age-related neuronal deficiencies, it might enable the choline to be properly metabolized. 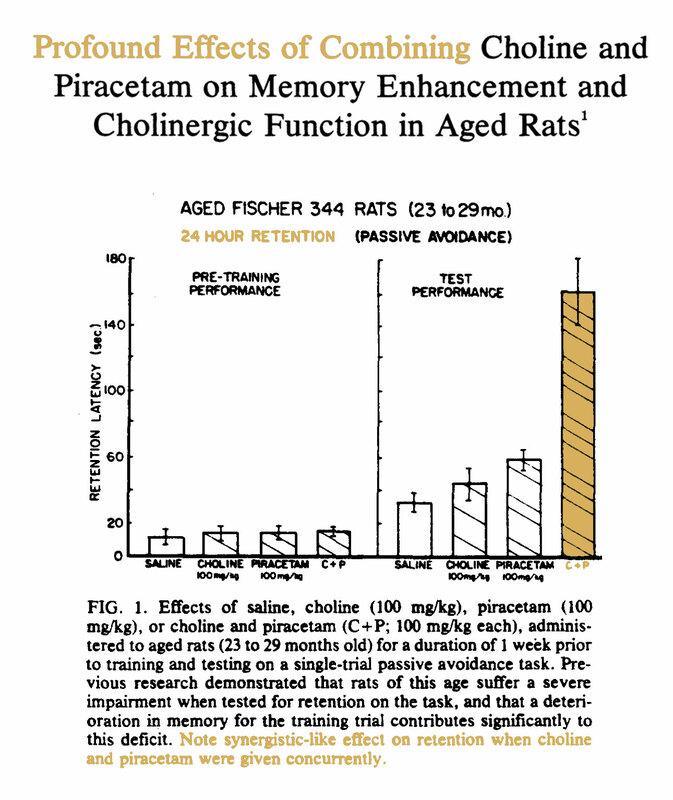 When they learned that piracetam enables the central nervous system to function more effectively, the researchers24)Profound effects of combining choline and piracetam on memory enhancement and cholinergic function in aged rats. Bartus RT, Dean RL 3rd, Sherman KA, Friedman E, Beer B. decided to run an experiment on aged rats. They administered choline, piracetam, alone as well as the combination of the two. Both choline and piracetam alone seemed to have a somewhat positive, albeit limited effect. However, when they combined piracetam and choline, the results were considered "profound." 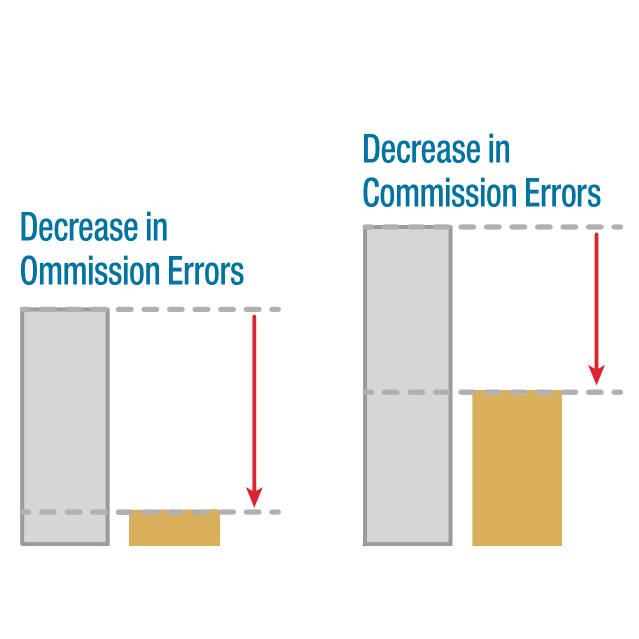 See the dramatic difference the combination makes in the gold bar labeled "C+P" in the accompanying graph. Our Gold & Silver stacks are based on the principles behind this synergistic combination of ingredients. Having firmly established the nootropic concept, by the early 1980s Giurgea began to imagine the development of more advanced nootropic molecules. 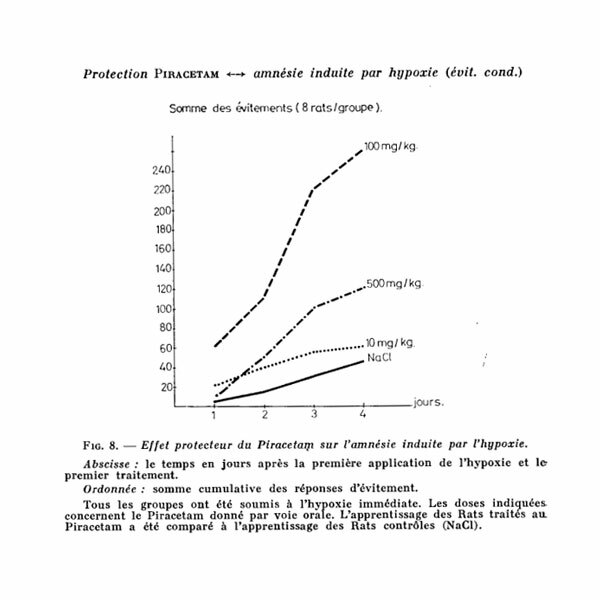 He wrote, "I do consider piracetam merely as the first"25)Fundamentals to a Pharmacology of the Mind, Chapter 9 of the nootropics and that "new nootropics should be made available, these should be more active than piracetam in terms of dosage, delay of therapeutic effect, duration of activity, etc. "26)Piracetam: Nootropic Pharamcology of Neurointegrative Activity, P264 He also thought that there should be versions that have a more specific effect on a given aspect of the nootropic concept. Giurgea was not sure exactly what would come next though, which is which is why he left a "?" 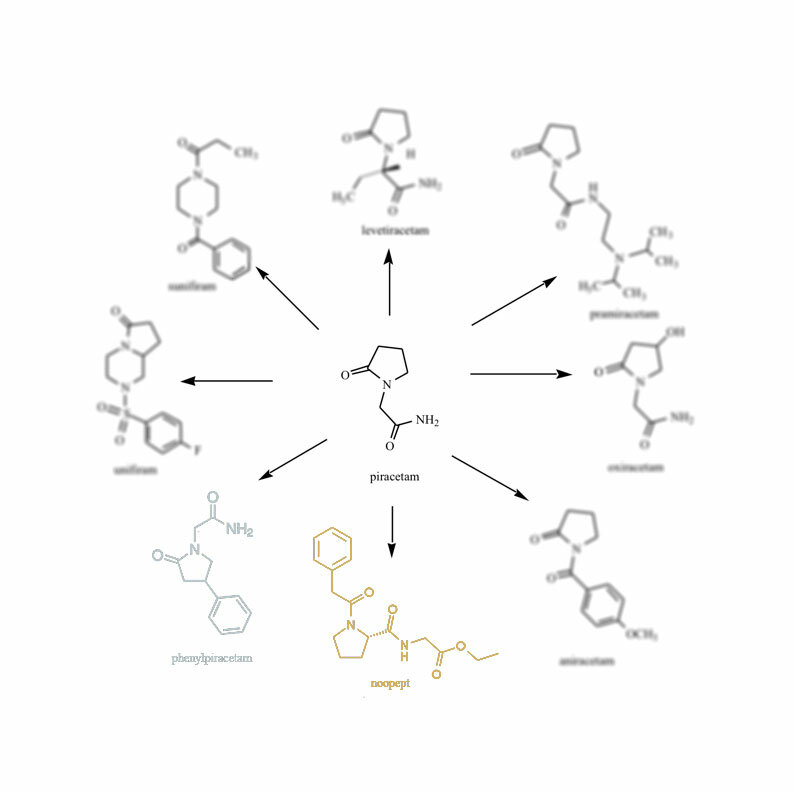 after Piracetam on the accompanying image showing where the nootropics classification fits. That question mark now has an answer, because more advanced versions of piracetam have been successfully developed. In the 1980s, labs began synthesizing new, more powerful versions of piracetam. Most of the time they kept the core structure of piracetam (the proline molecule) and made other modifications. Of those, Noopept and Phenylpiracetam, while very different from each other, stand out as the most promising versions to fulfill Giurgea's vision of a next-generation nootropic. Both were fully developed all the way through successful clinical trials and use in humans. 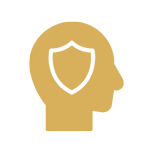 We have selected Noopept for our Gold Formula, and Phenylpiracetam for our Silver Formula. Noopept was designed as a peptide version of piracetam that would be significantly more powerful and orally bioavailable, and by chance, it had anxiolytic properties. Phenylpiracetam was designed to retain the cognitive enhancing aspects of piracetam, while also working to enhance endurance and processing speed. These are the nootropics selected for use in our formula due to the wide body of research on both, including decades of clinical use with demonstrated and well-known pharmacokinetics. 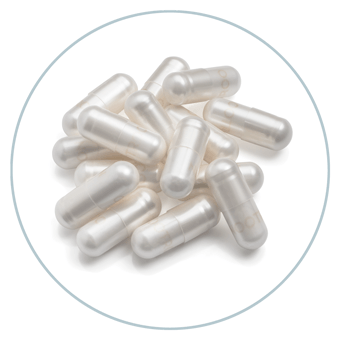 They are also consistently the top recommended compounds among biohackers in the nootropics community. The circles below show where the piracetam structure is within Noopept and Phenylpiracetam. Taking these advanced forms of piracetam and adding a bio-identical form of the body's preferred choline source, for its synergistic action, is how you get the Nootroo Gold & Silver Formulas. 3. 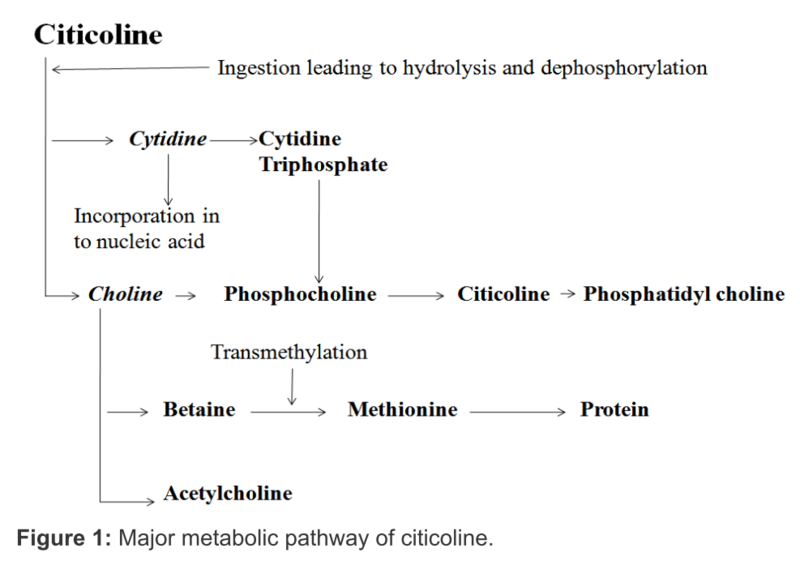 ↑ Citicoline enhances frontal lobe bioenergetics as measured by phosphorus magnetic resonance spectroscopy. 5. ↑ Giménez R, Raïch J, Aguilar J (November 1991). "Changes in brain striatum dopamine and acetylcholine receptors induced by chronic CDP-Choline treatment of aging mice". 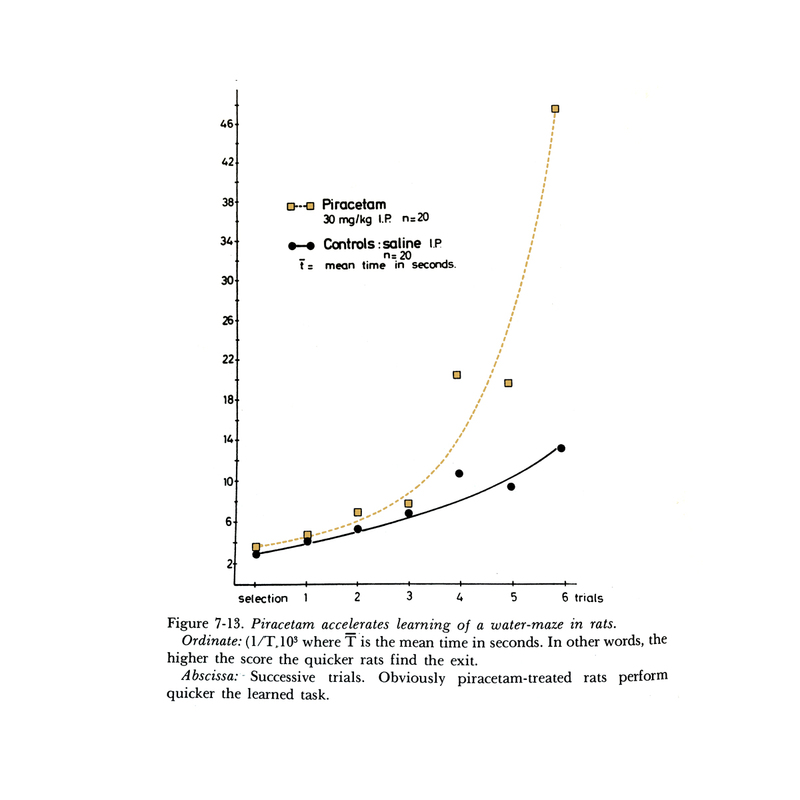 British Journal of Pharmacology 104(3): 575–8. 24. 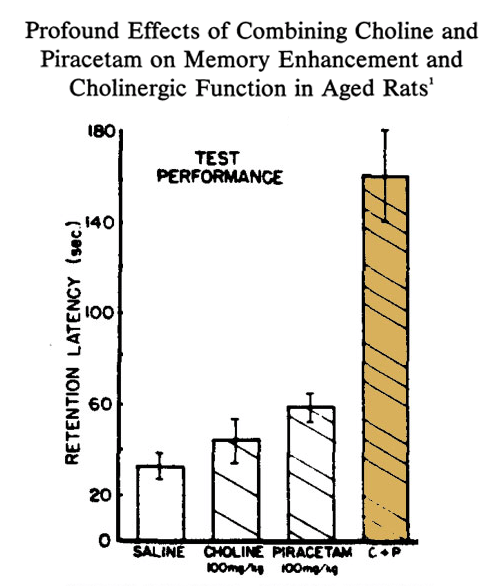 ↑ Profound effects of combining choline and piracetam on memory enhancement and cholinergic function in aged rats. Bartus RT, Dean RL 3rd, Sherman KA, Friedman E, Beer B.